Nose bleed is also called as ‘epistaxis’. It occurs more often in summer and specially in young children as a result of spending long hours in the sun, constant nose-picking, nose polyp or any other infection. Smoking cigarettes can also dry and crack the nose lining, and taking medications that thin the blood can cause severe nose bleeds. High blood pressure levels also precipitate an attack of epistaxis. Activities such as sneezing can put undue strain on the nose and can aggravate bleeding, so try and avoid situations which can cause sneezing during a nose-bleed. If the nose-bleed is due to any injury that you have sustained or if it occurs too frequently and for long intervals or if you suspect that it is due to high blood pressure/hypertension or due to any medication that you have taken then you need to seek medical help at the earliest. * Lying down during a nose bleed should be avoided. * Instead sit down and remain calm because the flow of blood might increase if you panic. Then gently pinch the soft portion of the nose between your thumb and finger to close your n ostrils for about 5-10 minutes. Lean forward to avoid swallowing the blood and breathe through your mouth. Wait for at least 5 minutes before checking if the bleeding has stopped. Almost all nosebleeds can be controlled in this way if enough time is allowed for the bleeding to stop. You can also apply cold compresses or ice packs from outside the nose. Once your nose bleed stops, avoid any rubbing, sniffing, sneezing, picking, or any activity can easily get it bleeding again, even after a day or two and wait for it to heal completely. 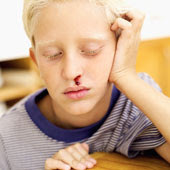 After you have had a nose bleed, often the inside of the nose will feel crusty, due to the formation of clots and scabs. Do not pick at your nose or try to remove these debris for at least 24 hours or you risk getting it bleeding again. *. Wash the face with cold water and also pour a small cup of cold water on the head. * Crush an onion and smell it a number of times. * With the help of a dropper put a few drops of the juice of Durva (Dhub) grass inside the nostrils. * Put 3-4 drops of freshly prepared Amla (Indian Gooseberry) juice into the nostrils. * Inhale the juice of fresh pomegranate (Anar) flowers or leaves or use these as nasal drops. * A small piece of camphor (Kapur), dissolved in the juice of green coriander leaves, and dropped into the nostrils also helps. * Powder of alum mixed with ghee can also be used as nasal drops. * Take equal parts of Red sandalwood (Rakta Chandan), liquorice (Yashtimadhu) and Naagakesara and make a fine powder out of them. Add 2-3 pinches of this powder in a glass of milk and take it. * Intake of fresh amla juice or the water in which dried amla is soaked overnight also helps. * Eat ripe figs with honey/jaggery or Amla churan. * A tsp of Chaywanaprasa with milk 2 times a day may also provide relief. Thank you for the quick ideas for stopping nose bleeds. With two little ones, it's a good thing to know. Thank you for participating in Fitness for Moms Carnival, 8th Edition. Come on by and check out the great articles included. you can not prevent nose bleeding by running cold water over your head and nose but there is a scientific logic b'hind doing this as cold water causes constriction of blood vessels of LITTLE'S AREA in the lateral wall of your nostrills.And to really prevent or stop nose from bleeding,you should pinch the tip of the nose with help of index finger and thumb keeping the head inclined forward and downward because raising the head up and backward thinking that it may stop bleeding actually will lead to aspiration of the blood into the lungs making this minor nose bleeding a fatal one. nose bleeds generally occur from acquired damage to the capillaries (little blood vessels) supplying the nose with blood. These capillaries are extremely fragile, so excessive hard blowing of the nose will cause them to rupture (nose bleed). This is not the only way they can be damaged, as you may be aware nose bleeds may result from different cases. But these capillaries are very superficial (close to the outer body surface). As far as your question will running water over your head and nose prevent them. I'm not sure if you used the right words, prevent means, your taken actions will not permit these results (nose bleed) from even occurring. To answer that, no. However, if you meant will running cold water over your head and nose will minimize the current bleeding and ultimately stop it. Wetting your forehead, will do nothing to stop the bleeding. As far as your nose, if you do scoop cold water into your nose this will help in terms of clearing the area of debri, doing so will increase the possibility of healing without infection. As far as stopping the blood flow, this method does nothing either. Hope this answered your question. They happen because little blood vessels in the nose burst for many different reasons. They can be serious if the bleeding is severe and not stopped. To stop a nose bleed, pinch the nose with both fingers for 5 minutes. If the bleeding continues, try once more. If it is not any better, you may need to go to the ER. It could be a varicose vein that needs to be cauterized. I usually bleed from one nostril in the spring when the weather gets dry. 1. The inside skin of your nostrils will crack because of outside temperature. Cracks like these cause nosebleeds. 2. During the winter, people tend to have runny noses. When your nose is running, it overproduces mucus, the clear stuff from your nose when you get a cold. Fairly known fact, mucus breaks down tissue, as mucus in your mouth breaks down food tissue you chewed. The mucus in your nose is being overproduced, so the skin is slowly being eaten away, causing cracks and nosebleeds (not to worry, your mucus is not going to eat your whole nose). Do not pick your nose, as it can cause further damage. Find some cold medicines that will help with runny noses so you don't over produce mucus. Let your nose run if you do not have medicines for colds. Taking a small cup of pomegranate juice with sugar candy, 2-3 times a day checks nose bleeding. Herbalists suggest using wild alum root powder. This will stop the bleeding immediately. Wild alum root is a powerful astringent. Dip a cotton bud in rose water and dab it on to the inside of your nostrils to stop the bleeding. Put cold keys down the back of your neck.. Within seconds the bleeding will stop. I donâ€™t know how this trick works, but I am sure it works. Just came across this site.. Good one! liked home remedy section. 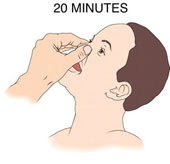 Pinch your nose together just below the hard section and hold it tight for at least 10 minutes. Sit down while you do this and lean your elbows on a table. Check after 10 minutes and if still bleeding hold for a further 10 minutes. The blood flow when stemmed will clot and block off the bleed site. If after a few attempts it does not work then get to a doctor or hospital. They can come from things such as stress, being nervous and worrying a lot. However a main cause is dry air - air not having so much humidity in it that's why most nose bleeds occur in the winter. If you're not getting them frequently then its not much of a concern especially if its really light. If they persist or do get very heavy and a bit scary then contact your doctor but for now id say its not much of a problem getting the odd nosebleed - it happens to a lot of people even if you're not prone. It could be allergies. I have that problem but not as bad when I do not get enough Vitamin C. So maybe your friend need to take some Vitamin C. Have your friend talk to his doctor. For a bloody nose, lay on the ground and have someone firmly smack the bridge of each foot with the palm of their hand. The nosebleed should immediately stop. Sometimes hitting it right takes a little practice. To stop a nosebleed pinch the nose firmly (but not hard) at the bridge of your nose just below the bone. Do NOT lie down or tilt the head back, as this makes the blood go down your throat and will make you sick to your stomach. Hold this pinch for 2 -3 minutes until bleeding stops. Do NOT blow your nose. This will blow the clot out and make it start bleeding again. Put some Ice in some water and let it get cold.Fold up a section of paper towel,even a section of brown paper bag or a coffee filter will work,fold it up till its about 1/2' wide by 3'.Soak this in the ice water and then place it on the gum just under the nose and above the upper teeth and press it into place.Hold it there by closing mouth,The bleeding will stop in a little bit.Sometimes you need to repeat it,so soak two strips and have one ready. Take cayenne, goldenseal, and white oak bark to help with bleeding. A Nosebleed that has worked for me. Take a wet flannel, put on the sufferer's neck and get them to tilt their head back. This site may help people who are unable to find out the Doctors and other Medical amenities. Stick some tissue up it to clot it pinch your nose and go to the doctor,how long has it been going on? How do ice packs help nosebleeds? The cold helps to constrict blood vessels and capillaries, slowing down the flow of blood until it can coagulate. Don't apply ice for more than 20 minutes at a time. I liked the article its very interesting and informative. Keep up the great work. Do not blow your nose or put anything into it. If you have to sneeze, open your mouth so that the air will escape out the mouth and not through the nose. Try to keep your head higher than the level of your heart. drink water and ask your doctor.